For once I went into the theatre not knowing exactly how a novel-to-screen adaptation was going to turn out. Usually I read the book first and then see the film but for once I hadn't. I hadn't even really heard about the book series until earlier this year when the London Snapchat story started to play the trailer in the middle of snaps. I'm so glad they did because since the beginning of January, I've been getting more and more excited! I do think that the producers should have advertised it more though. It may be big in America but definitely not here in England, with only 3 cinemas even showing the film on it's opening weekend, in central London. I was shocked when I tried to find locations on where to watch it. Click here to watch the trailer and here/here/here to go to the books. You'll be glad to know I have now bought the whole trilogy so I will be reading them in the summer when the third comes out. 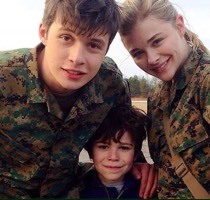 The 5th wave starts with a shooting but then looks back on Cassie's perspective of the events that have been going on recently. Four waves of increasingly deadly alien attacks have left most of humanity destroyed and Cassie is on the run, desperately trying to save her younger brother. The story begins with mankind discovering a space ship flying orbiting planet Earth, leaving humans to watch from below and wait. The removal of any electronic device leaves the world in unknown territory, natural disasters kill off even more of the population with earthquakes, floods and the world literally cracking apart, before a deadly influenza virus strain takes out almost everyone left. 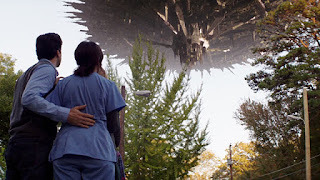 With only a few people left on the Earth, everyone bands together and they help each other until they realise that the aliens can inhabit humans now. Now they can no longer trust their friends and everyone must go their separate ways. If they see another human, another lone survivor, they have to run. Run in the opposite direction. Run away as far and fast as they can. For me, I wasn't expecting massacre suicide shootings or the good guys to become the bad guys but this clever plot has twists and turns a plenty as an action packed film never seeks to surprise me. Thrown in with all the running and shootings and life threatening missions, the main character Cassie still finds time for a little romance. An unexpected love triangle occurs between Cassie, Ben Parish - the high school quarterback and secret object of Cassie’s affection before aliens - and Evan - the handsome hero/isolated farmer/unknown. The story seems to be split between Cassie's trying to get back to her brother, following a separation due to a teddy bear, and collective children being trained by the army to become soldiers. I felt so sorry for a little girl nicknamed Teacup, who screamed at every bang but was still sent out to be attacked and the attacker. You couldn't help but fall in love with both her and Cassie's younger brother, Zackary Arthur: he is so cute! I have just seen this film in the cinema and wow what a thrilling experience it was! The 5th Wave provides a fresh new twist on the alien invasion genre. 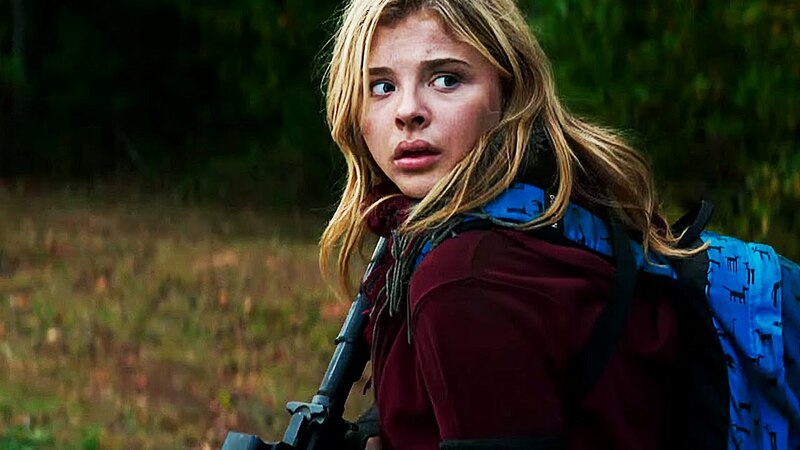 I thought the acting was seriously amazing; Chloe Grace Moretz showed so much emotion, I fell in love with her all over again and can't wait to see what else the up-and-coming star has to show in the future. I always like a little eye candy and girls can get the best of both worlds with pretty boy Nick Robinson or the rugged Alex Roe. While I loved this film and world highly recommend it for the young adult dystopia fan, I can't help but be worried that a sequel might not happen. I think with the cliché romance rushed through and the pace changeable, critics may be harsh.